We have achieved our goal for Bodie's surgery! Thank you all so much! Some wonderfully generous people have pledged their help to pay for Bodie's surgery. We are very grateful for this much needed support! Bodie (aka Porter) is an extremely sweet, amazingly accepting, and quiet little fellow. When we rescued him, he was on "the list" to be put down that same day, with no other options except us. Several people who saw him at the shelter asked us to save him. When he arrived, we noticed that he was holding a rear leg up much of the time. An x-ray of Bodie's leg revealed a very old and badly broken leg, that must have occurred when he was still a growing puppy. Bodie's currently about 1 year to 18 months old. The leg has not grown properly and the vet recommended surgery, which he estimates will cost $600 to $800. The day we rescued him must have been a very confusing and stressful day for him. Yet, when he was poked and prodded by the vet, each time he quietly tolerated all the indignities without complaint, and signaled his forgiveness with a low wag of his tail to his handlers. Bodie is wonderfully easy going, calm, and patient, not to mention, great with everyone, including cats, dogs, and children. On his first night in his foster home, they found him sleeping with the cat! Please help us pay for Bodie's much needed surgery. Any amount would be greatly appreciated. If everyone who reads this contributes a little - even $5 or $10 - towards Bodie's surgery, we should collect enough to pay for his procedure. 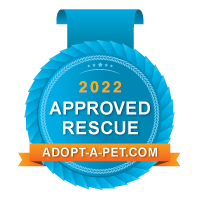 As a federally approved 501(c)(3) organization, donations to our rescue are tax deductible. We will keep you updated on this little guy's progress! We teamed with Countryside Rescue to save Bodie and get him the help he needs. November 19, 2011. Tessa has just been adopted, and is now settling into a wonderful new home! Tessa has the best qualities of a herding breed, loving, loyal, and playful without being busy or high energy. She is about 1 year to 18 months old. Each day, we are learning more and more about her. Tessa is completely house trained and crate trained. She will head into a cozy crate when she wants to rest. She is very good on leash, and loves to ride in cars. She sits quietly in the car and enjoys watching the world go by. She is very good with other dogs, but she is usually focused on and very attentive to people. We believe she will bond very quickly when adopted. She will wait for you calmly and patiently, and is a happy and playful girl when she knows it's time to play or be active. Tessa is very observant, super smart, and a very quick learner. Despite the misfortunes Amber suffered before entering our rescue, she has been the happiest and most optimistic trooper! Amber has been adopted by a herding-dog-saavy young couple, who also have a border collie, Jack. He loves the smell of freshly brewed coffee, and that was his name while in our rescue. Now named Tucker, this playful guy is the baby in his new family. He has an older sister, Tillie, and parents with time to play ball with him. They are one big happy family, with plans to go on road trip vacations together. HAPPY TAILS: Gizmo's new home and best friend! Gizmo is a mini-sized blue speckled cattle dog pup, who had been stray and in much need of TLC. He has a wonderful new family, who does everything together. HAPPY TAILS: Boss (aka Bosco) Finally in His Forever Home! HAPPY TAILS: Tassie (and Peanut's) Great New Life!